What are the flexor tendons? The flexor tendons are strong smooth cords that connect the muscles of the forearm to the bones in the fingers and thumb. There are two to each finger and one for the thumb (See diagram). The tendons run inside tunnels at the wrist and in the fingers, and they bend your fingers in the manner of a bicycle brake cable. The tendons can be damaged by any cut across the palmar surface of the wrist or hand, especially at the finger creases where the tendons lie just under the skin. 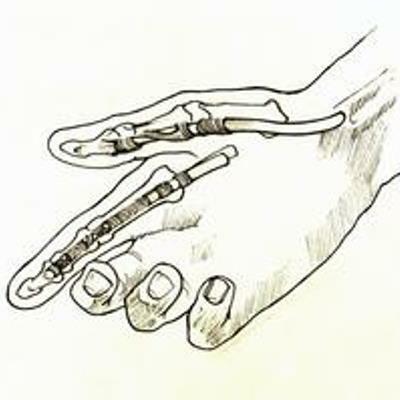 Occasionally, the tendon is detached from the bone by a violent pulling injury to the finger. What are the signs of a flexor tendon injury? Finger lying out straighter than the adjacent digits. There may also be numbness of the finger due to injury to the nerves, which lie close to the tendons. A hand surgeon will test the tendons individually to ascertain their integrity and decide if a repair is needed. X-rays may be taken if the injury was caused by glass. Occasionally, ultrasound or MR scans are needed to give more information about the tendon. Tendon repair. Cut tendons do not heal by themselves; the tension in the tendon causes its cut ends to separate, sometimes by several centimetres. Without surgical repair, there is no prospect of regaining the movement that has been lost. The repair may be performed under general anaesthetic or regional anaesthetic (injection of local anaesthetic at the shoulder). The wound is enlarged so that the cut ends of the tendon can be found and held together with stitches. At the end of the operation the hand and forearm are immobilised in a plaster splint that is placed over the bandages with the wrist and fingers in a slightly bent position, in order to protect the repair. Hand therapy. The hand therapist will usually replace the plaster splint with a light plastic splint and start a protected exercise programme within a few days of the operation. The therapy programme after tendon repair is crucial and at least as important as the operation itself, so it is vital to follow the instructions of the therapist closely. The objective is to keep the tendon moving gently in the tunnel, to prevent it sticking to the walls of the tunnel, but to avoid breaking the repair. The splint is usually worn for five or six weeks, after which a gradual return to hand use is allowed. However, the tendon does not regain its full strength until three months after the repair and the movement may improve slowly for up to six months. A cut flexor tendon injury is a serious injury. The wound may be small, but the large forces carried by flexor tendons and the tendency for the repaired tendon to stick to the walls of the tunnel mean that despite a skilled repair and good hand therapy, many fingers do not regain full movement. But repairing the tendon is better than not repairing it. The repair breaks. It usually happens early on as the tendon is at its softest at this stage of healing. The patient may feel a "ping" as the repair snaps or simply notices that the finger isn't bending in the way it has been. If you are concerned that your tendon repair has broken you should contact the surgical or therapy team immediately, as the opportunity to repair the tendon again may be lost after a few days. The tendon sticks to its surroundings and does not slide in its tunnel. Then the finger can be moved with help from the other hand (called passive movement) but will not move on its own (active movement). More hand therapy may help. In some cases, an operation to release the tendon from the scar tissue (tenolysis) may improve the movement, but full movement may not be regained.